Benchmarks’ Partnering for Excellence (PFE) is a model that seeks to improve the well-being of children and families in contact with the child welfare system and reduce the need for higher end behavioral services through a more trauma-informed community, which can reduces in health expenditures. Private providers become more trauma-informed through the use of evidence-based programs, which PFE helps bring to the community. MCOs become more trauma-informed in authorization and in policy and practices. DSSs and the broader community become more trauma-informed through the use of National Child Traumatic Stress Network (NCTSN) trainings regarding trauma. PFE redesigns the local child welfare/behavioral health system, changing the way DSSs, MCOs, local providers, and the wider community understand trauma and the need for accessible, appropriate mental health services for children, youth and families who have experienced potentially traumatic events. PFE aims to lead communities to an understanding of the importance of trauma-informed and trauma-responsive communities, to create a lasting change in the identification and treatment of trauma within the community. MCO/DSS staff co-location. Relationships built from co-location allow for the provision of feedback on appropriate services in a pro-active manner, creating a shorter transition time between identification of need and provision of services. Cross-training of DSS and MCO staff. PFE fosters better understanding of mandates and procedures across systems and agencies, which helps partners work together and streamline services. Cross-agency collaboration. Private providers, DSS staff, MCO staff and others have regular meetings to share lessons learned, talk over how to move past obstacles, and fine-tune the project pathway. Across all systems, staff feel mutually invested, which leads to effective problem-solving. PFE aims to provide cost savings by decreasing entry into DSS custody and reducing the need for high-end behavioral health services for children involved in the child welfare system. Between the start of the PFE pilot project in Rowan County in February of 2014 and April 2016, 435 youth involved in child welfare were screened for trauma. These children were either in DSS custody or receiving In-Home/Treatment services. Early data show that 90 percent of the children overall have screened positive for trauma, and that 100 percent of children in DSS custody have screened positive. Children who screen positive for trauma through the Project Broadcast Screening Tool are referred for a Trauma-Intensive Comprehensive Clinical Assessment (TiCCA) – an in-depth evaluation by a trained, certified mental health clinician that helps the social worker, mental health professional and others involved in the child’s case fully understand what the child has experienced and how those experiences have affected and are continuing to affect the child. Highlights physical health, educational strengths and needs, and the current living environment. Getting it right the first time. One strong, comprehensive assessment at the outset of a case can clearly identify the child’s needs and serve as the basis for referrals to the right services and the appropriate model of care. Evidence-based models, including Trauma-Focused Cognitive Behavioral Therapy, are used as primary interventions. The TiCCA helps identify behaviors stemming from trauma, creating trauma-informed diagnoses to ensure the best fit of treatment. A comprehensive assessment that leads to appropriate services for a child results in the child recovering and learning coping skills, thereby needing fewer services, rather than providing treatment for an inaccurate diagnosis. The TiCCA seeks to “clean the wound” instead of simply putting on a band aid. Investing in prevention and reducing the cost of intervention. A comprehensive assessment as soon as a child enters the child welfare system can bring to light needs as well as past history that might not otherwise be noted. Treating these needs with evidence-based models quickly can help the child work through previous traumas and, in turn, decrease externalizing behaviors. Less-intensive treatment needs means Medicaid cost-savings. Informing on family functioning. The comprehensive assessment measures the wellbeing of the entire family unit. A strong, functioning family unit is critical in ensuring that children are well and successful in their lives. Regardless of the current living situation of the child, PFE works to ensure that parents and children are working together in the treatment setting. The assessment offers suggestions regarding what services might be needed by parents in order to create and maintain a functioning family environment. A TiCCA provides the MCO with comprehensive information, allowing the MCO to best allocate service dollars. Instead of youth “failing up” to more restrictive and costly mental health services, comprehensive information allows for the correct placement based on a child’s needs. PFE Works. 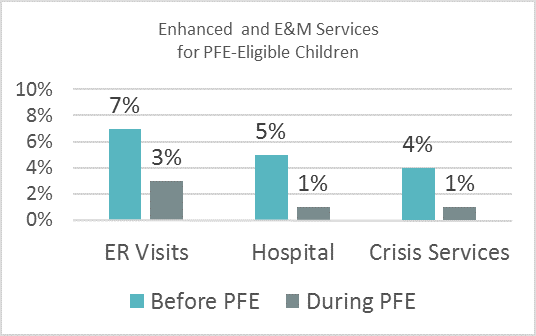 Early PFE outcome evaluation results indicate that the project is off to a hugely successful start. Accurate Diagnoses. More children are being accurately diagnosed with PTSD and fewer with psychosis-related disorders (see Figure 1). Figure 1: This figure includes only the diagnoses of PFE-eligible children; diagnoses with small incidences were suppressed. “During PFE” also includes past diagnoses. Appropriate Services. The PFE model is reducing the need for expensive, high-end behavioral health services by establishing a relationship with a clinician early on in the process and proactively addressing the youth’s trauma, rather than waiting for externalizing behaviors to develop. The result is that children can remain in the community instead of needing higher levels of care. Initial data suggest that more children are being assessed and receiving outpatient therapy (see Figure 2), and fewer children are requiring higher-level services. After the first 10 months, fifty percent of youth had received mental health assessments as compared to 35% for the 2 years prior to PFE. 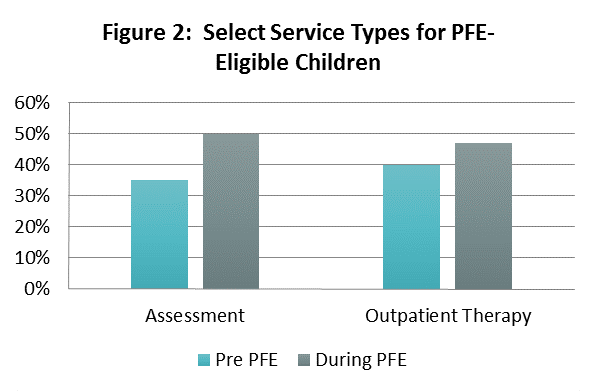 Figure 2: This figure includes only some of the service types for PFE-eligible children; service types with small incidences were suppressed. 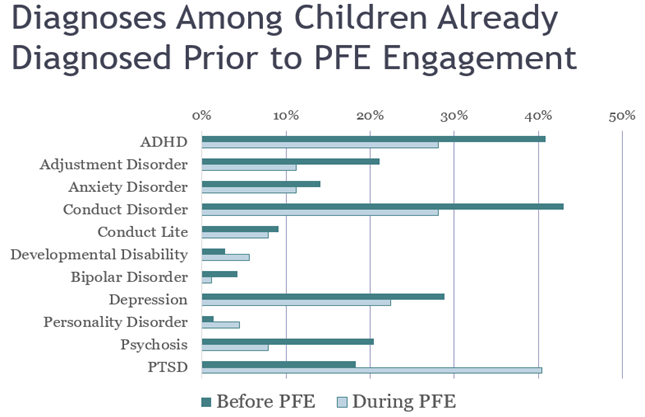 Under PFE, more children get properly diagnosed, with a focus on trauma instead of just on behaviors, and they get appropriate services right away. Clear diagnosis and quick treatment means children need less intensive levels of treatment (see figure 3), which saves money. Most importantly, children and families get better, sooner. The National Association of Counties. National Association of Counties (NACo) granted Rowan County and Benchmarks the 2016 Achievement Award for its program titled “Partnering for Excellence” in the category of Children and Youth. 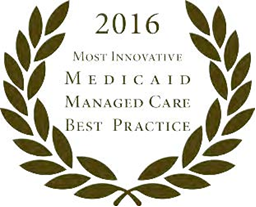 Institute for Medicaid Innovations. Benchmarks’ Partnering for Excellence Project was submitted by Cardinal Innovations for submission into the Institute for Medicaid Innovation’s Medicaid Managed Care Best Practices Compendium under the category of Children’s Health for submission into the Institute for Medicaid Innovation’s Medicaid Managed Care Best Practices Compendium. Not only did our Partnering for Excellence Project win The Most Innovative Children’s Health Best Practice Award, it was also received the overall award for The Most Innovative Best Practice among all of the categories. Practice Notes. Partnering for Excellence (PFE) was published in the most recent issue of Children’s Services Practice Notes. Practice Notes is sponsored by the NC Division of Social Services and produced by the Family and Children’s Resource Program, part of the Jordan Institute for Families at the UNC School of Social Work. View article here. The MHS conference. Jenny Cooper, Benchmarks’ Partnering for Excellence Project Director submitted a paper “Partnering for Excellence – Using Collaboration to Improve Outcomes and Decrease Trauma” and was selected to present the content at speaker at The MHS conference in Auckland, New Zealand.